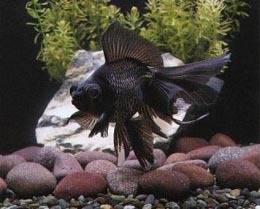 Shall I Kill My Fish Or Not? I have a fish named Ritchie. It is an extraordinary looking thing with two enormous eyes bulging out on either side of his sweet little fish-head. Sadly, Ritchie is Ill. Over the last few months, his right eye has been growing, and is now six to eight times bigger than the left one. This has affected his ability to swim, as he finds it impossible to retain his balance, working desperately hard only to flounder grotesquely about the tank. In the last couple of weeks Ritchie has all but given up and, exhausted by the continual effort of trying to stay erect, simply floats upside-down in the tank, only perking up at feeding time, his one huge eye wobbling horrifically from side to side. Is it cruel, keeping Ritchie alive in this way? Or is he happy? What do I do? Please help me out. Shall I flush Ritchie down the toilet? Should I? Well? No. He's happy, although lopsided.